Our favorite blue cheese to use in this blue cheese chicken recipe is the Italian blue cheese Gorgonzola. Gorgonzola has a very smooth, creamy texture that makes it perfect for sauces. To help soak up the creamy sauce, serve the blue cheese chicken over a plate of pasta, mashed potatoes, or sauteed greens. Slice each chicken breast lengthwise through the middle, creating two thin chicken breasts from the original breast. In an ovenproof saucepan, heat olive oil over medium heat. Sear the chicken, cooking three minutes on each side. Simmer another minute then put the pan in the oven for about 10 minutes, until the cream reduces into a thick sauce. Gorgonzola comes in two styles, Dolce (sweet) and Piccante (Aged). Gorgonzola Dolce is very creamy with fewer blue streaks. 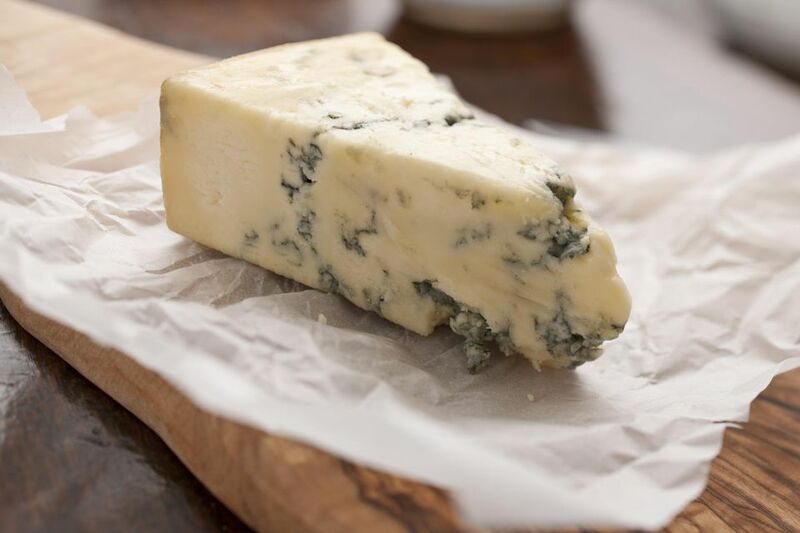 Compared to other types of blue cheese, it has a sweeter, milder flavor. Gorgonzola Piccante (once called Naturale or Stagionato) has a firmer, denser texture, but one that is still very creamy. Gorgonzola Piccante has a more pronounced flavor, often described as spicy and sharp. It is typically aged between 6 to 12 months. The Italian town called Gorgonzola was supposedly a resting place for tired herdsman and their cattle who were trekking to and from high mountain pastures. Local farmers used the milk from the cattle to make cheese. Originally, the blueing in Gorgonzola appeared naturally from ambient strains of Penicillium mold in the caves where the cheese was aged. Wheels of Gorgonzola are now turned blue with a commercially manufactured mold called Penicillium gorgonzola. What Type of White Wine Should I Cook With? Never cook with wine that you wouldn't sip from a glass. If it doesn't taste good in a glass, it's certainly not going to do your recipe any favors. However, this doesn't mean you have to spend a lot of money. There are many decent, affordable wines, especially whites. For cream sauces, Chardonnay can be a good choice. Chardonnay is often described as having a rich, creamy texture that complements creamy sauces. When in doubt, a nice Sauvignon Blanc is always a good choice for cooking. Or, since this recipe uses Italian Gorgonzola, you could always choose an Italian white (Chardonnay, Pinot Grigio). Ask for suggestions at your local wine shop. They're sure to have a few favorite, inexpensive whites to recommend.